Ipods possess allure for kids everywhere. My kids are no exception. Bailey, being the oldest, got the first ipod a couple of years ago. She carried it around continously for about a month. I would go into her room at 3AM and she’d be sprawled out on the bed asleep with her ipod buds in her ears. She only had a few albums. One of them was the David Archuetta album. She called his album her “sleepy music”. Which meant that was the music that she slept to. 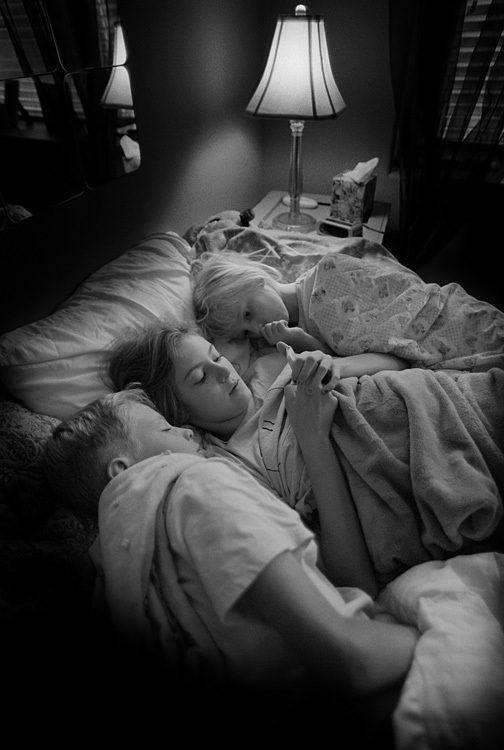 One morning at about 6AM I went into her room and all of the kids were laying there together. Jack and Lily always angled ways to steal away a moment of bliss with the ipod but Bailey ran the controls. They weren’t allowed to touch it. I don’t know how long they had been laying there but Jack fell asleep. Lily is on the brink of sleep sucking on her thumb. Baileys ipod tolerence was high. Canon Eos 1n 35mm SLR. Tri-x film. Exposure unknown, but my best guess is one second at f5.6. I have had myself say that many times in the past and have been bitten by the notion of the fix-all Photoshop. In reality Photoshop does not fix-all. It has its limitations. Often what seems like a simple “fix” ends up taking hours and never really looking right. In this photograph I had my Canon 1n on a Bogen tripod with a ball head in my bedroom. When I saw the situation I grabbed the tripod and light meter and within one minute had captured the photogaph. If I had to give an equipment list for a new photographer with 500 dollars to spend? Thats my idea of a good start to excellent photography. You can get a high quality, reliable camera. Perfect exposures, sharp images and a load of actual photographs that you can look at, stack and sort without a computer. Plus scans on CD which you can fool with in Photoshop.